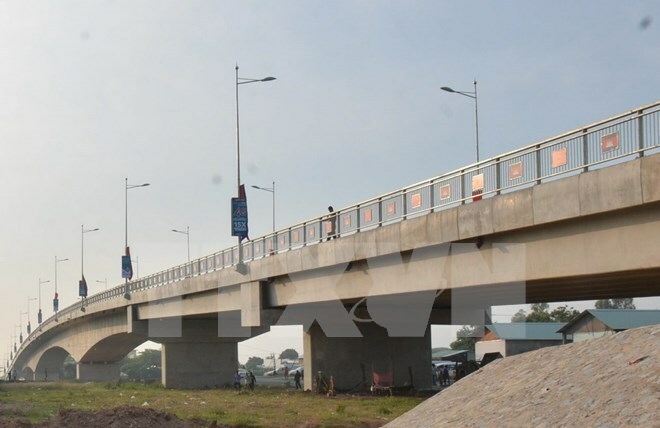 Hanoi (VNA) – The Long Binh – Chrey Thom Bridge connecting the southern province of An Giang in Vietnam and Cambodia’s Kandal province was inaugurated on April 24. The inaugural ceremony, which took place in Kandal, saw the attendance of Vietnamese Prime Minister Nguyen Xuan Phuc and his Cambodian counterpart Samdech Techo Hun Sen along with tens of thousands of people living in the two countries’ shared border lines. PM Phuc highlighted the accomplishments in bilateral cooperation, including positive outcomes in economics, trade, investment, security-defence, culture, education and tourism. He noted that the collaboration between Vietnamese and Cambodian localities, especially cross-border ones, has been enhanced. The PM stressed the significance of the bridge, saying that it will become the shortest route connecting Cambodia’s Phnom Penh capital with Vietnam’s borderline, thereby promoting bilateral trade and contributing to poverty reduction in disadvantaged border areas. The two PMs agreed that the bridge is not only significant in terms of economy but also politics, culture, society, security and defense, and described it as a symbol of solidarity, friendship and sound cooperation between Vietnam and Cambodia. PM Hun Sen took this occasion to thank the Vietnamese Government and people for supporting Cambodia to escape from the Khmer Rouge genocide regime. At present, Vietnam still assists Cambodia in the cause of national building and sustainable development, he added. The construction of Long Binh – Chrey Thom Bridge commenced in January 2014. The Vietnamese Government provided a credit package worth 18.76 million USD to help the Cambodian government build the bridge. This is the second biggest transport project in Cambodia following the construction of Highway 78 using the Vietnamese Government’s preferential credit.